Josiah Henson was born into slavery on June 15, 1789 in Charles County, Maryland. As a young boy he witnessed slavery’s cruelties inflicted on his immediate family. Young Henson watched his father receive fifty lashes for standing up to a slave owner and then witnessed his father’s ear being severed as part of the punishment. Shortly afterwards he watched his father sold off to an Alabama slaveholder. Upon the death of his owner, Henson was separated from his mother and siblings in an estate sale. Although he was reunited with his mother, he never saw his siblings again. Henson remained on his new owner’s farm in Montgomery County, Maryland, until he was an adult. As he aged he rose to become a trusted slave and supervised other enslaved people on the farm. However, he used his new position to make his escape from slavery. Following the Underground Railroad, Henson escaped from Maryland to the Province of Upper Canada (present-day Ontario), Canada with his wife and four children by way of the Niagara River in 1830. 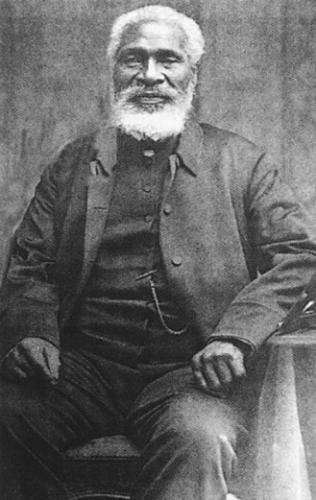 Josiah Henson worked on farms near Fort Erie and Waterloo, in his first years in Canada to support his family. Then four years later in 1834 he moved with friends to Colchester and set up a black settlement on rented land. He was then able to purchase 200 acres in Dawn Township near Dresden in Kent County. The Dawn Settlement prospered, reaching a population of 500. It thrived on its exports of black walnut lumber to the United States and Britain. Henson eventually purchased another 200 acres next to the settlement, where he and his family lived. Henson also became a Methodist preacher. He went on lecture tours and spoke as an abolitionist throughout Britain and Canada. He also worked as a conductor on the Underground Railroad between Tennessee and Ontario. In addition to his service on the Underground Railroad Henson served as a military officer in the British Army in Canada. While serving he led a black militia unit which supported the colonial government in the unsuccessful uprising by Canadian insurgents during the Rebellion of 1837. In 1849 Henson published his autobiography, The Life of Josiah Henson, Formerly a Slave, Now an Inhabitant of Canada, as Narrated by Himself. Henson’s autobiography is widely believed to be the model for Harriet Beecher Stowe’s 1852 best selling novel, Uncle Tom’s Cabin. Following the success of Stowe’s novel, Henson expanded his own life story in an 1858 work titled Truth Stranger than Fiction, Father Henson’s Story of His Own Life. Two decades later another version of his autobiography appeared. Josiah Henson is honored by the country of Canada with the plaques that they have displayed around his cabin, the famous Uncle Tom’s Cabin, located near the Dawn settlement. This settlement is now a historic site. One plaque reads “Henson’s celebrity raised international awareness of Canada as a haven for refugees from slavery.” Henson is also the first black person to be featured on a Canadian stamp.